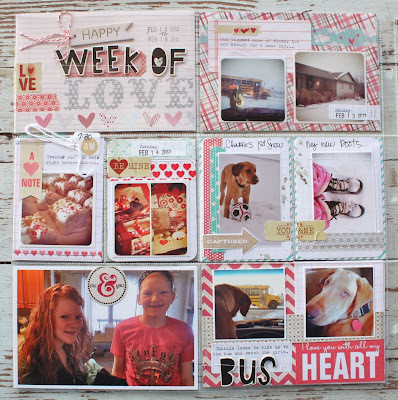 I've got my Project Life Week 7 done along with some inserts. You may have noticed that I haven't done a PIP (Project Life in Progress) Day post lately....have been a little busy so have just spent the time working on my pages to catch up. Hopefully I'll more time to get back to those as I do enjoy sharing the progress. I'll share a few thoughts with today's pages though. You can definitely tell it was Valentine's week for Week 7. Lots of Valentine themed colors & products used, with a My Mind's Eye 6 x 6 paper pad as my inspiration. 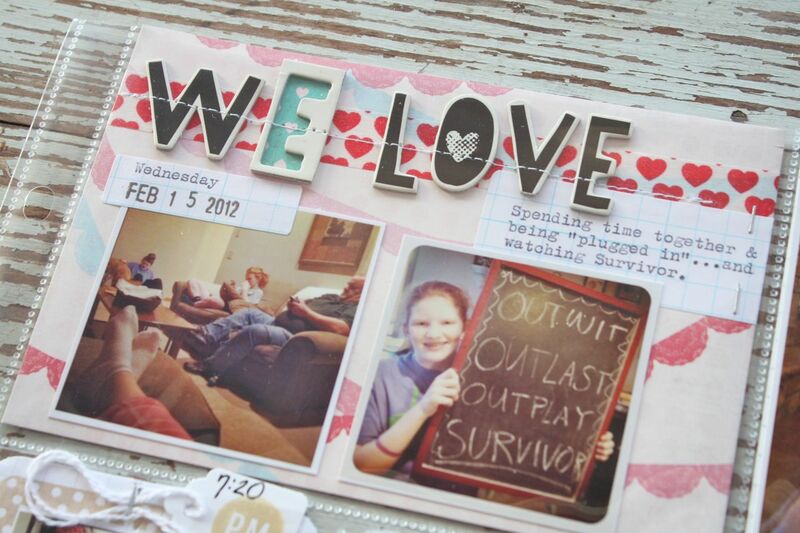 I made a title card use that theme on a lot of the inserts...things we loved this week. 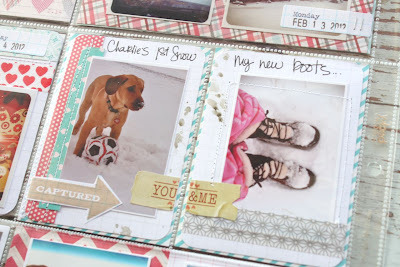 As I flip through my pages so far for 2012, I notice they are colorful...and busy...and jam packed with photos. Who knows if I will keep up this pace. Maybe I'll go back to very simple some day. 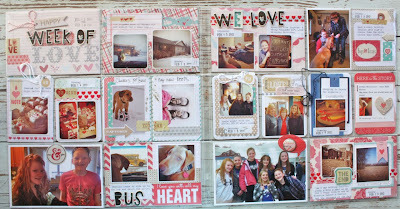 For now I love the scrappy look and the many, many photos. Starting with my title card, I used a page from the MME pad + chipboard stickers, Washi tape and twine. Here are my 3 x 4 journaling cards. Each one this week has a photo. Just lots to share this week so I included it all. Here I used a free printable from Elle's Studio. I used my xacto knife to trim around the flag then slipped my photo underneath. Charlie's first big snow day. He didn't know what to think at first but was soon plowing through the snow with his soccer ball. I chased him around while wearing my new boots...and pink, plaid pajama pants. A movie night is always fun. The moms joined in also and we all saw The Vow. A very fun....and pricey night. 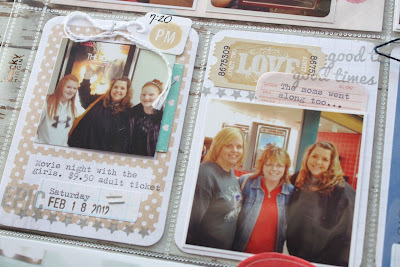 I used a frame stamp from Studio Calico + a ticket sticker + sticky note from Studio Calico + stamped small white tag from my shop. You'll notice that all my dates are stamped on a small grid label this week. 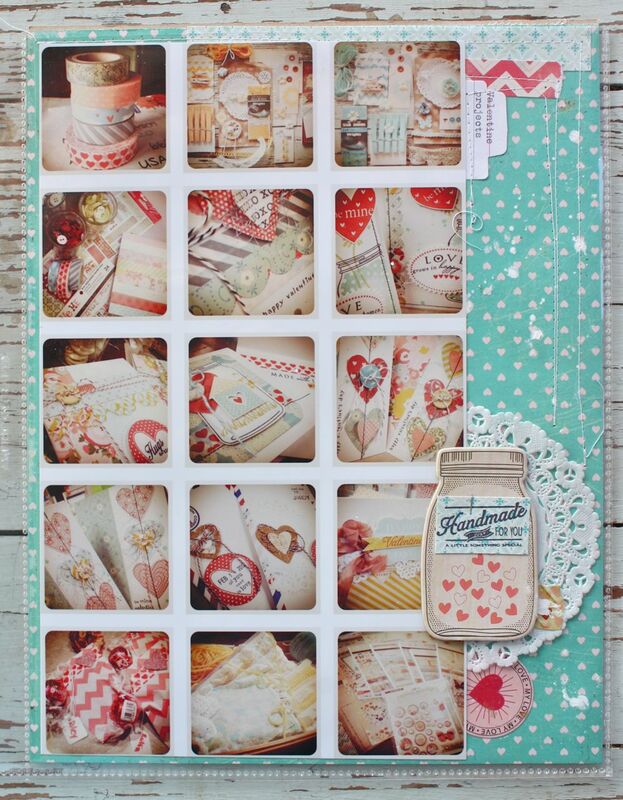 Those grid labels were from a kit shown in this post from my shop recently...just in case you purchased a kit and are looking for ideas. 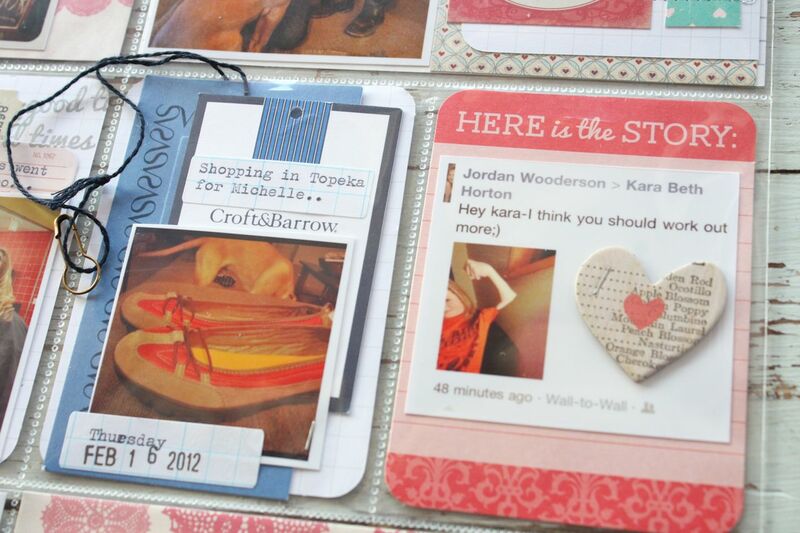 Here I included some tags and a photo of some new shoes from a shopping trip. On the right I printed off a Facebook post that Jordan sent to one of her best friends. She altered a photo of her friend to make it look like she had really measly arm muscles. Always a crack up, that Jordy. 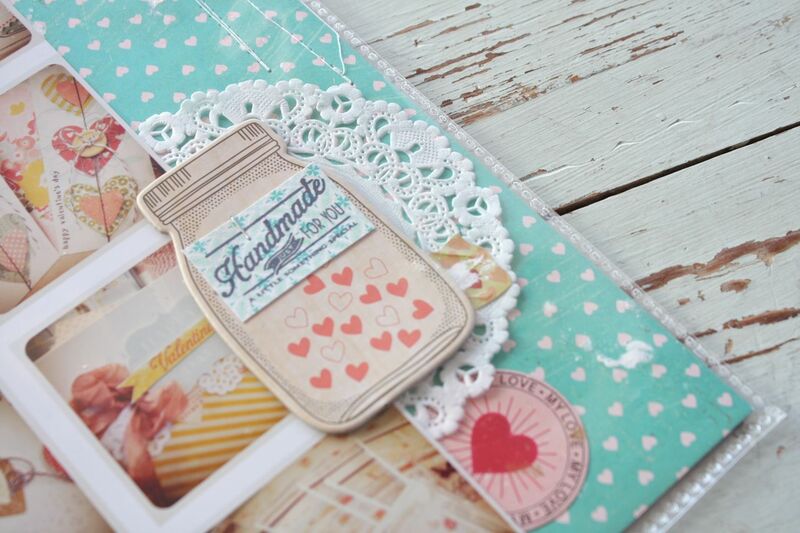 Chipboard heart is from Dear Lizzy's American Crafts line. We were hoping for a snow day but alas the bus came and went. This was our heaviest snowfall to date this winter..barely dusting the ground. And sweet Charlie boy. He loves when he gets to ride up to the bus with the girls. He scrunches his head up into the dash so he doesn't miss a thing. He also got a new heart charm for his collar with his name engraved. 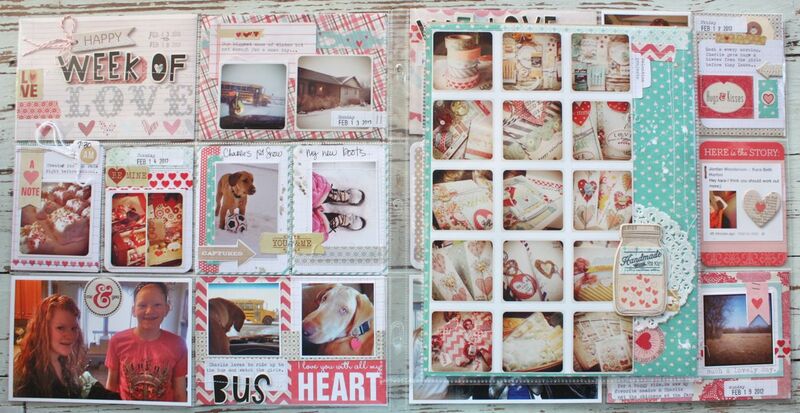 I think the printable on the right was another Elle's Studio freebie. 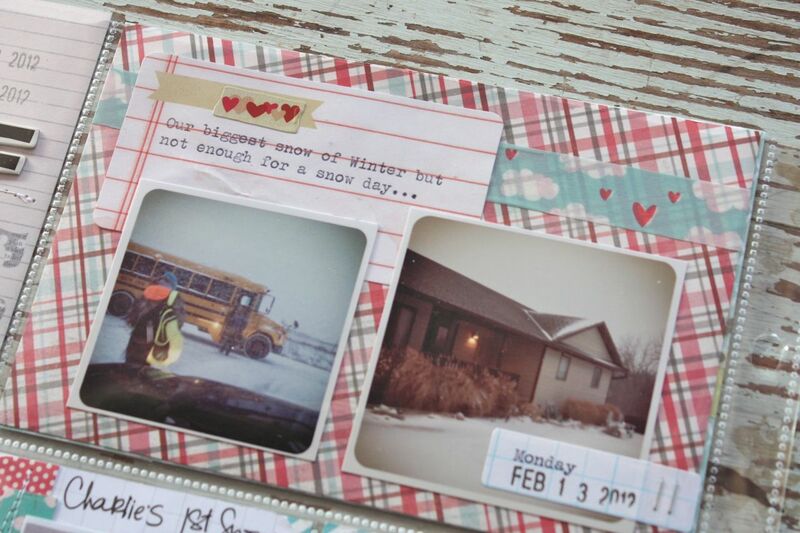 I typed my journaling on a Grid Label and then stitched on chipboard letters on top. Another 4 x 6 insert with more chipboard. I ran out of *e's* so I used the negative shape from the packaging and backed it with patterned paper. 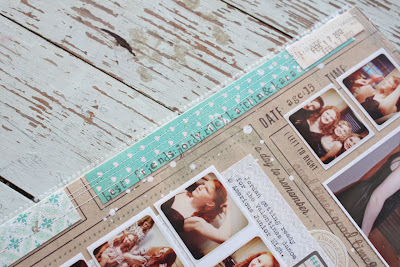 More grid label dates + Washi tape + grid label journaling with tiny staples. Here I used a Project Life journaling card, topped with a sticker, patterned paper scrap and chipboard arrow. 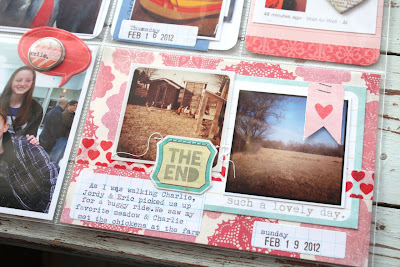 My last insert which shows a fun day we had around the farm. 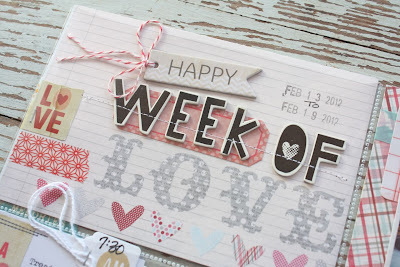 I used a sticker with *the end* stamp from Studio Calico to wrap up our week. On the very left you can see a quote sticky note from Studio Calico with an epoxy brad from My Mind's Eye. 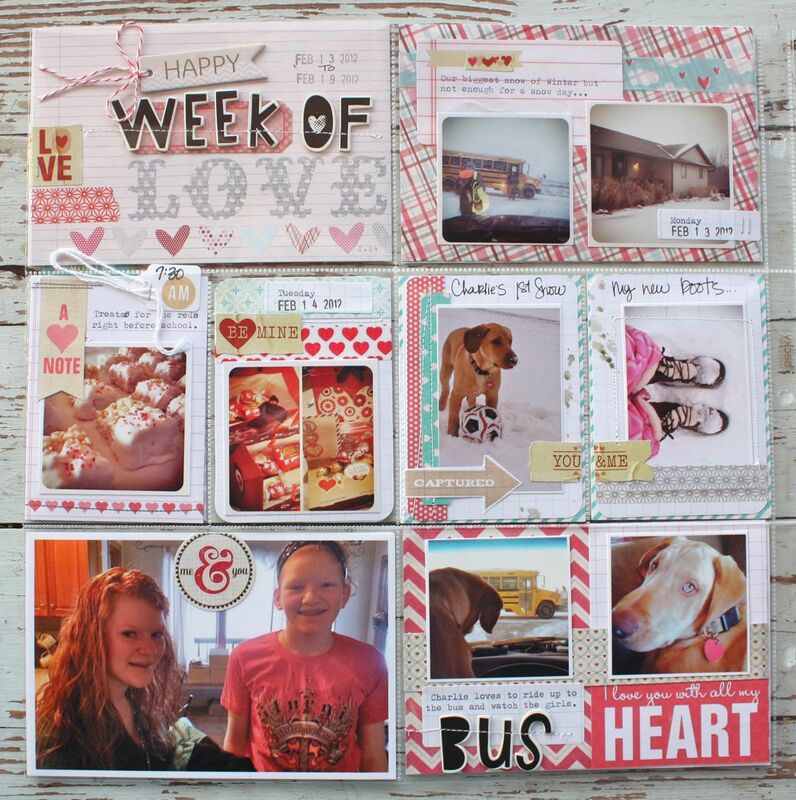 And more inserts this week. 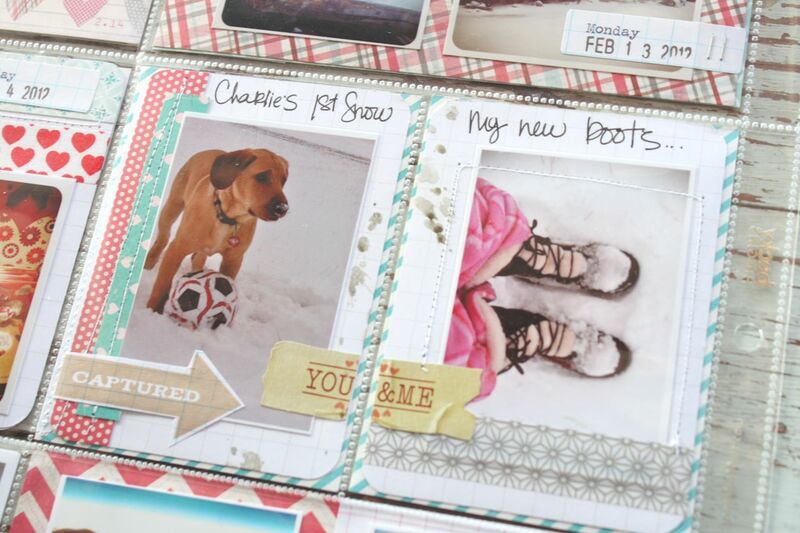 I used a Project Life 8.5 x 11 page protector and made two inserts, front and back. 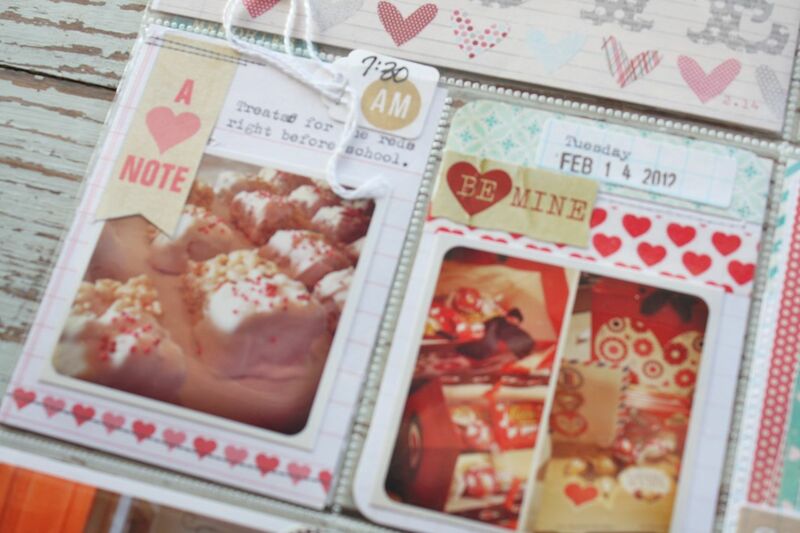 The first insert features a collection of Instagrams of all the little pretties I made for Valentine's Day. Sometimes I like remember what I've made after all those fun cards go out in the mail. I can fit 15 Instagrams on one sheet of 8.5 x 11 printer paper, using only my printer's programming for the collage. I think these sizes are 2 x 2. I have to confess...big scrapbook pages intimidate me. I'm so used to working on a card size that when you give me a big sheet of paper and some photos, I don't know how to fill in the spaces. 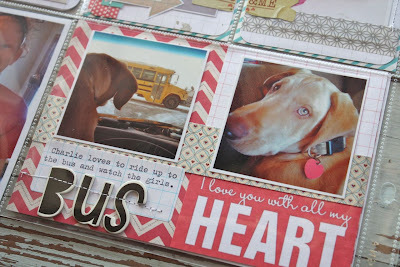 So I usually print lots of photos because that's my focus anyway....and just add a few embellishments. I would love to make more layouts with 1-2 photos and that wonderful collage look.....but that's just not my style. I've always liked to include as many photos of an event as possible which just leaves little room for all the pretties. I do love it every now and then. I love that feeling of completing a layout. And I love all the inspiration I get from those scrappers that can make those beautiful pages. It's fun to pull little ideas on a smaller scale from those pages. Here's the back side of my insert. This is a collection of photos from a junior high dance that Jordan went to. She got ready for the dance with 3 of her besties and it was so fun to capture their fun moments. 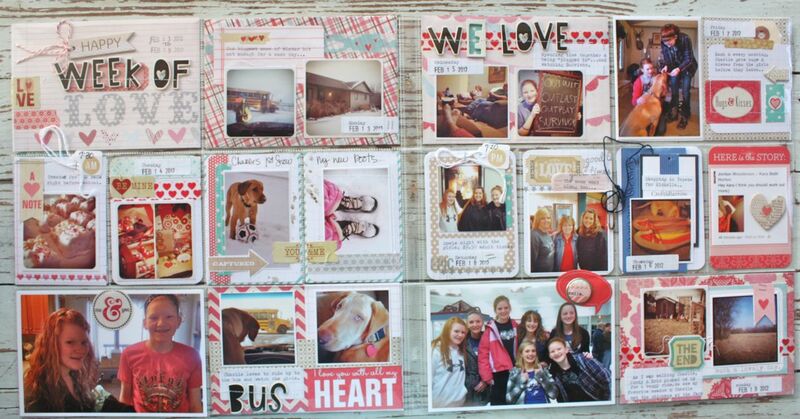 I used more Instagrams on the bottom and just regular printed photos on the top of the layout. 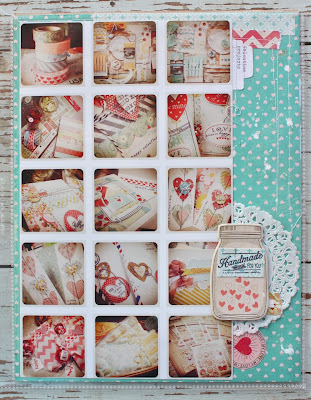 I got some freebie My Mind's Eye paper in a recent 2 Peas order and it was the perfect starting point for a layout. 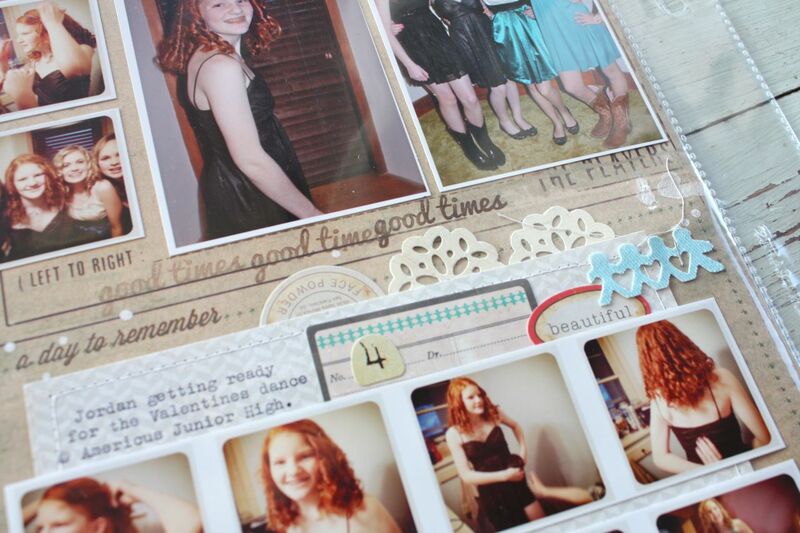 I trimmed the block style paper down to 8.5 x 11 and just added photos and patterned paper to all the blocks. 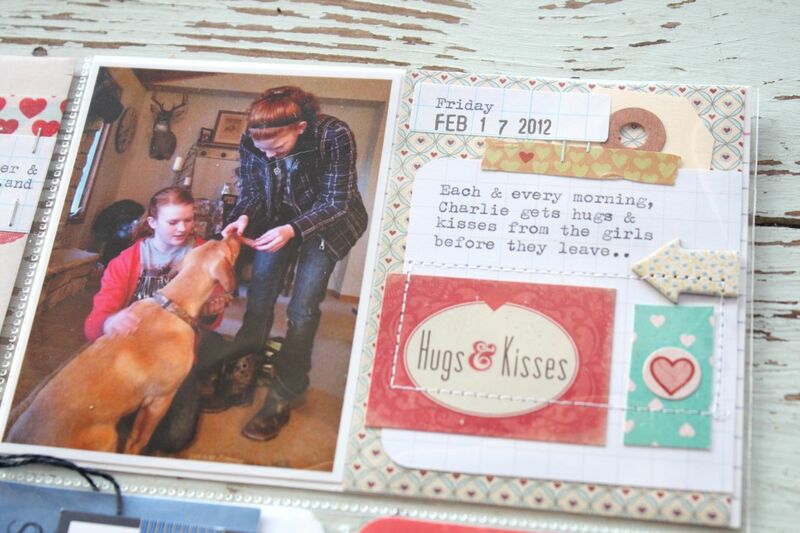 I used some stickers and punches as accents along with some Studio Calico stamps. 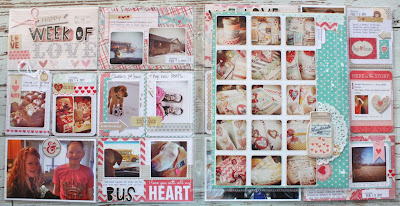 Scraps of patterned paper from my main Project Life pages were an easy way to tie this week all together. 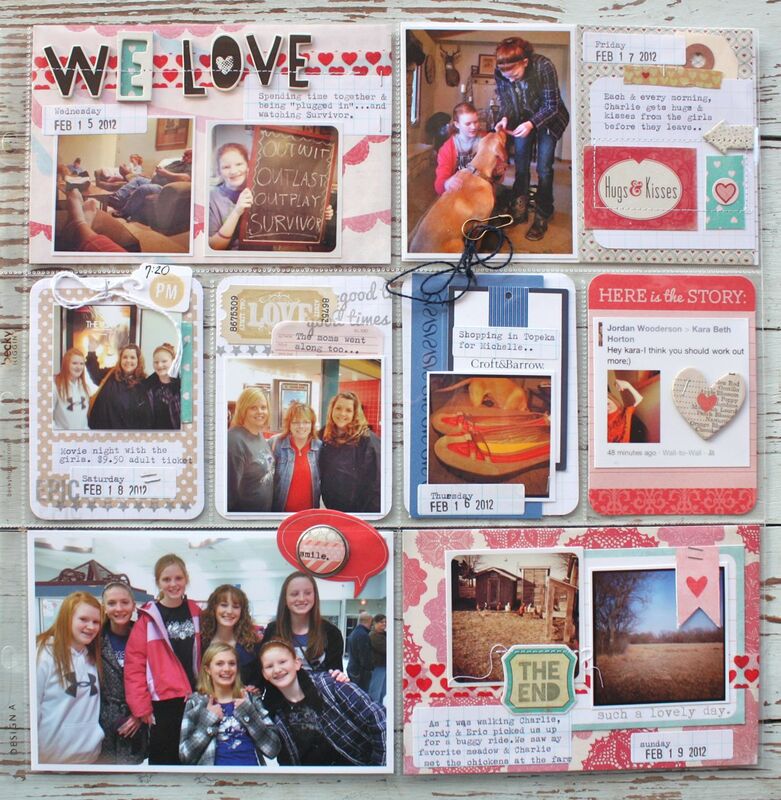 Again, lots of photos and just a few design elements. And that's my Week 7. How are we all doing? Are you keeping up? I'm just enjoying the process right now. I have some busy weeks coming up in March and the end of the school year is where I have fallen off the last 2 years. 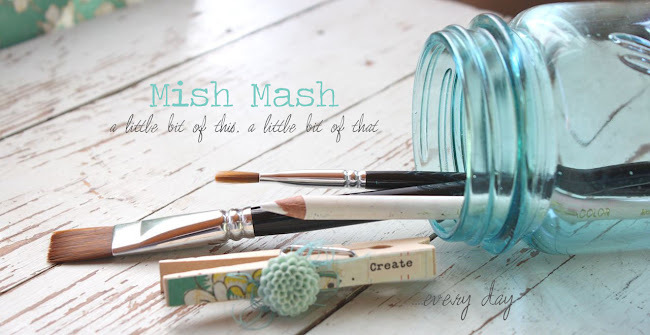 I want to make sure that I make adjustments so that I can keep up this year. I might print less photos. I might just do simple journaling. I'm keeping it all in the back of my mind so that I can be prepared. I'm a tad behind on project life. Lol. I'm doing pretty good keeping notes of the pics I've taken and what I want to include in a week's pages so I am hoping to be caught up within a week. :) thank you for sharing your pages!!! Wow Michelle you have done a great layout once again! 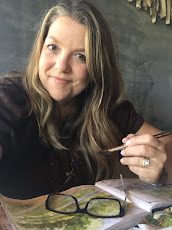 Your pages inspire me no end! 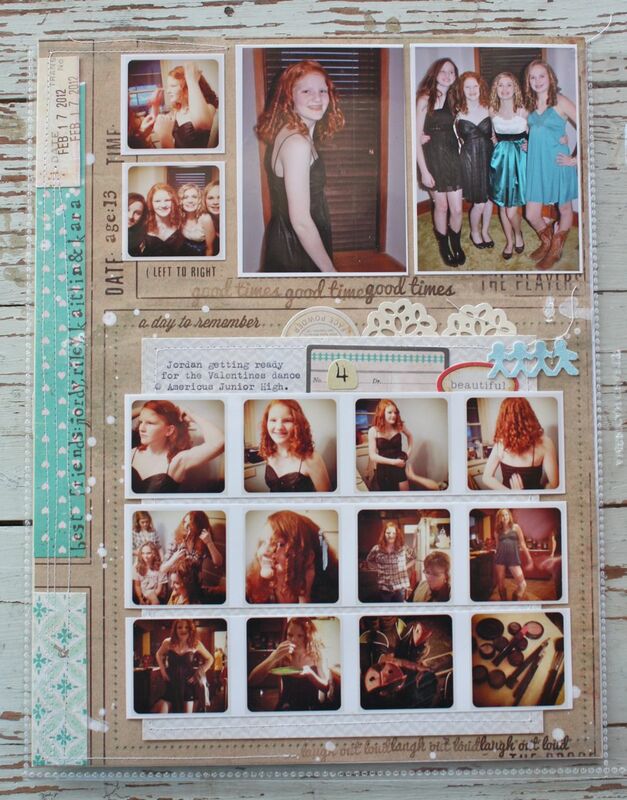 I love the way you use your inserts and the smaller photos on one page, just wondering how you print them all on the one page? What settings do you use? 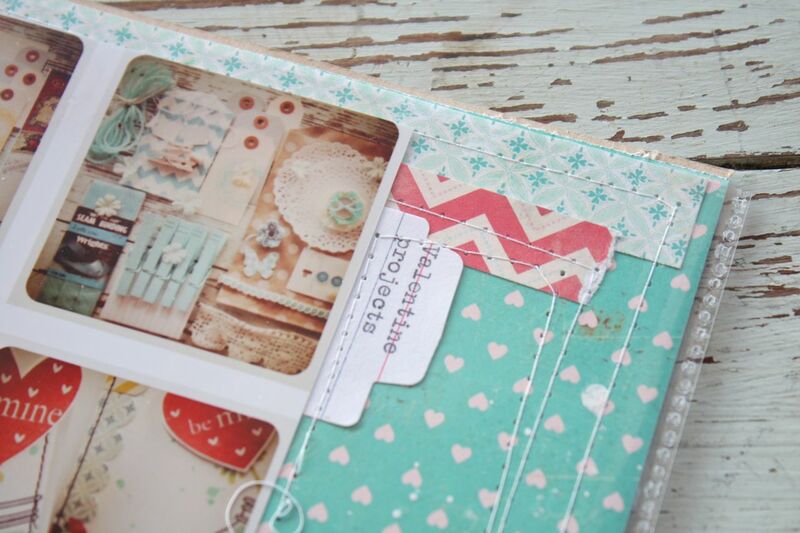 I love that each pocket is a little scrapbook layout on it's own! as always very inspiring to see your beautiful pages. LOVE this layout!! 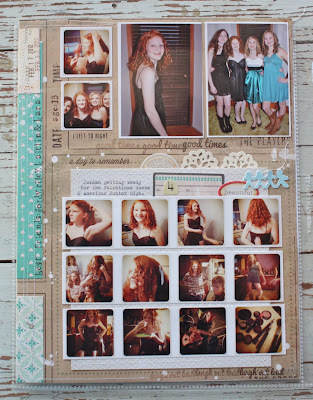 My fav is the 8x11 insert. I just love the look of all those little instagrams together! I wished I could zoom in though to see all the delicious projects you made. Jordy looks beautiful for the dance-what fun to have your bff's to get ready with. My daughter and I also saw The Vow and loved it. I rented Jane Eyre for this weekend-we are having rain and tornados here in Knoxville TN!